This bad boy of Rochford was a shoemaker by trade, and a smuggler, poacher and troublemaker by inclination, who spent his freetime in bawdy pubs jeering and scoffing at religion and generally causing mayhem. His wife eventually took him in hand and insisted he reform and go to church. He reformed to such an extent that he eventually became a preacher at the Methodist Church but, in 1837, due to a difference of opinion, James and his friend William Bridges set up their own church in an old workhouse building. This became his first Chapel. They later moved to James' cottage in Workhouse Lane. The group called themselves "The Peculiar People", 'peculiar' meaning 'special'. James was an ugly but charismatic man with a voice like thunder. The sect grew rapidly and people flocked from miles around to hear James preach. In time, chapels were set up all over Essex. The sect had strict rules; they believed in spiritual healing and many followers were conscientious objectors. They denounced doctors, many of them believing in miracle cures, which led to the deaths of several children. When James' own child became very ill James, despite his convictions, sent for a doctor. This led to him not being allowed to be a Bishop but just a regular preacher. During the 1950s, the Peculiars, or Banyardites, changed the name from the Peculiar People’s Chapels to Evangelical Chapels. 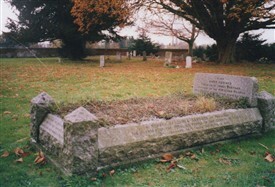 Banyard is buried in the St Andrew’s Church, Rochford. This page was added by Helen Walkling on 13/03/2013. There are two Harrod articles on the site which will be of interest. If you put Harrod in the search box in the top right corner of the main page you should easily find them. I wrote yesterday but I am not sure if my comment in your comments section went through. My great grandfather James (he was born around 1950) Harrod's uncle was a former bishop in the Church of the Peculiar People. Family lore has it that this uncle had facial cancer and lost most of his nose! We understand that my great grandfather and great grandmother Elizabeth Smith Harrod retired to Thundersley- lived in two houses next to each other and may be buried at the Church of the Peculiar People in Daws Heath, Thundersley - by the common. We do have a picture postcard sent from there. I currently live in Canada. I seem to have exhausted my internet search for any information but wondered if your organization might help? Thank you. Yes, it got through Terry, I've also posted this email you sent us the day after, Regards RDCA-Admin. I am doing genealogical research on my family too. My grandfather was James Harrod. His uncle was known to be a bishop in the church of peculiar people! The story is that he had facial cancer and lost most of his nose. We heard stories about Thundersley as children. Would be interested in following this up. Would anyone know if there could be a family relationship?